VMware Log Insight provides an easy, at a glance, view of an entire VMware environment including NSX and other components. Additional available content packs provide predefined knowledge about events. Problems with a vSphere environment can be identified by simply looking at the Overview dashboard. 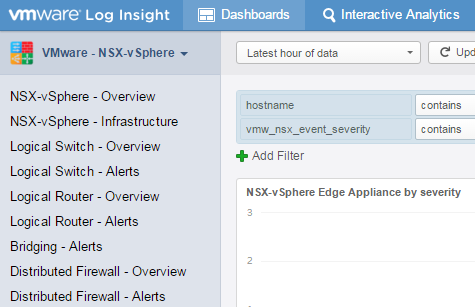 This post describes how to integrate all NSX Components into VMware Log Insight.